Proposed building would be more than 1,100 feet tall. 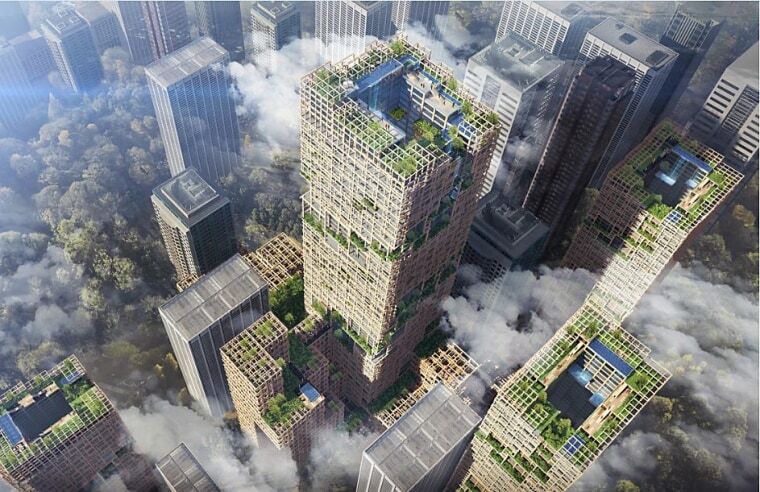 Skyscrapers made mostly of wood are rising around the world, and now plans have been announced to build what would be the world’s tallest “plyscraper” in Tokyo. The planned 70-story, 1,148-foot tower will include residential and commercial space and is intended to spotlight environmentally friendly architectural designs and construction technologies, its developer, Sumitomo Forestry Co., announced in a written statement. Plans for construction of the “W350 building” are underway, though the tower isn't scheduled for completion until 2041. The total cost is estimated at 600 billion yen ($5.6 billion). The high-rise would dwarf the University of British Columbia’s 174-foot, 18-story Brock Commons building in Vancouver, Canada, which is currently the world’s tallest wooden building. Drawings of the new tower — a 90-percent wooden building with vibration-damping steel braces — show a boxy structure whose gridlike façades are studded with balconies and festooned with greenery. The building’s wood-lined atrium will enclose a large pool filled with reeds and lily pads. Sumitomo said its goal for the building is to show how cities might be transformed from artificial environments into a forest-like environment that is "a pleasant space for the people living there." John Fernandez, a professor of architecture at MIT, understands that rationale. "Timber buildings are very easy to associate with and fall in love with and appreciate because the material itself appeals to people," he said. "Buildings that people really appreciate, value and feel something for are more sustainable than otherwise because people will protect them and take care of them." Another goal for the building is to showcase the versatility of wood. Though wood has long been used as a building material, only recently have new forms of wood made it possible to build tall buildings out of wood. “There’s a whole bunch of new materials made out of wood that are structurally able to build big buildings,” Dr. Michael Ramage, a senior lecturer and head of Cambridge University’s Center for Natural Material Innovation, told CNN. One such material, cross-laminated timber (CLT), is said to be stronger than concrete and more fire-resistant than conventional wooden building materials. Perhaps paradoxically, experts say that building with wood can be more sustainable than building with steel and concrete. Wood stores carbon that otherwise might wind up in the atmosphere as the greenhouse gas carbon dioxide, whereas the production of concrete and steel releases huge amounts of carbon dioxide into the atmosphere. And while building a tower the size of W350 requires the toppling of more than a few trees, “the amount of wood used in this building can be regrown in our global forests within a matter of hours,” Casey Malmquist, founder of SmartLam, a CLT manufacturer in Columbia Falls, Montana, told NBC News MACH in an email.